Chloe used to love Christmas, but this year she doesn't have any plans. She's living alone and there's no special person in her life at the moment. She and her husband Gianni split up a year ago and went their separate ways. They grew apart and Chloe couldn't take feeling neglected anymore. She left and he let her go. When she gets a call with a job offer she's surprised when she finds out it's for Gianni's new restaurant in Appledore. Chloe is an events manager and Gianni needs her help. Chloe isn't particularly happy with the job, but maybe it will bring them some much needed closure? Gianni hasn't exactly made friends in Appledore, He lets his temper rule his actions and that keeps getting him into trouble. Will Chloe manage to get him out of it again? While trying to make Gianni see the error of his ways, good memories of the past come to the surface. Gianni shows Chloe he still has a kinder side as well and their shared love for food gives them a chance to reconnect. Is their marriage truly over or will the magic of Christmas bring them back together? 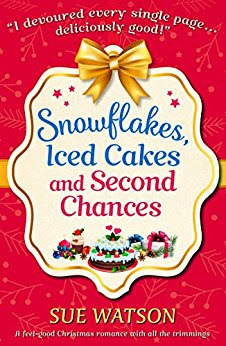 Snowflakes, Iced Cakes and Second Chances is a wonderful festive story. Chloe is practical, sweet and romantic. She loves the holidays and likes to make people happy. Gianni is a difficult man. He's temperamental, fierce and incredibly proud. He's passionate about food in a fantastic artistic way. He can cook really well, but he doesn't have good people skills. He offends, shouts, scolds and sulks, but combines this with a cute sense of humor, which is absolutely adorable. It's clear from the start that he and Chloe have a complicated bond. They went through a lot and my heart ached for their losses. They don't handle it well and there's fire and ice in their relationship in abundance, which is an interesting combination and I couldn't wait to find out where that would lead. It's clear from the start that they are each other's soul mates and I was anxious to discover if love would be enough in this case. Sue Watson has a lovely warm writing style that always manages to put me in a good mood. She has a great sense of humor and knows how to work with tension in her stories. This combination makes them a real treat. I enjoyed the intensity of Snowflakes, Iced Cakes and Second Chances and admired its spirited dialogue. The story is fascinating, merry and strong. I'm a big fan of books about true love and the possibility of second chances and this is such an amazing one. Sue Watson combines this with mouthwatering descriptions of food and it's obvious she knows what she's writing about. The result is a fabulous story that often made me smile. I highly recommend this dazzling, delicious and energetic Christmas book. If you love heartwarming Christmas stories with passionate main characters and good food you will definitely like Snowflakes, Iced Cakes and Second Chances. This book sounds great. Thanks for the review. I will have to check it out. I love the cover and it sounds like a great read too! They may be as fire and ice but there's plenty of passion there! I do love second chance romances & it sounds like Chloe & Gianni complement each other enough to make it work. It sounds like they have a stressful marriage.